Besides being able to travel long distances on your own, there are many requirements for individuals who wish work as transport truckers. Below you will find a comprehensive list of what you’ll need to gain employment in this field. Usually, secondary school must be completed, although there are some employers that don’t require this. You will need the proper training for your specific type of load (This is usually provided on the job). Hauling food will have different safety requirements than hauling gasoline. An accredited driver-training course must be completed. These courses can be taken at a vocational school, community college or trucking academy and last about 3 months. You will need the proper license. 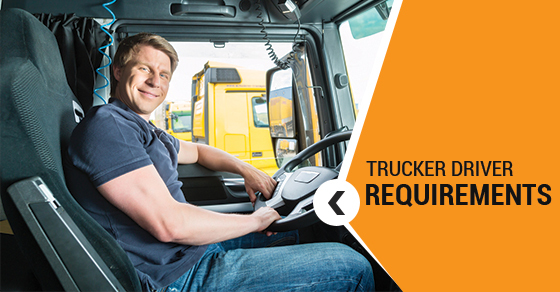 For straight-body trucks, a Class 3 or D license is required. For other vehicles, a Class 1 or A license is necessary. Additional licensing certification might be needed if you plan on driving articulated trucks. If you will be working to transport hazardous materials and dangerous goods, you must become TGD (Transportation of Dangerous Goods) certified. If the vehicle you’ll be operating has air brakes, you must obtain an air brake endorsement. Transport truckers must be able to obey safety and traffic regulations. This means following posted speed limits and learning to operate your vehicle in residential areas. You’ll be sharing the road with motorists day and night and will need to anticipate their every move before they make it. Being alert while driving is imperative. Pre-trip planning is important for truckers. If you don’t know the road before you go, you’re more likely to have an accident. Truckers need to be able to think quickly and visualize geometric shapes. Is it the headlights of a motor vehicle? Is it a deer? Is it debris? You need to be able to figure out what is coming towards you so you can react accordingly. You’ll need to be in good health. Some heavy lifting is required in this field and if you can’t lift or move with dexterity and ease, you won’t last long. As a trucker, you may find yourself working unconventional hours. You’ll need to adapt to working at inopportune times and make sure you get adequate sleep. Finally, you’ll need to enjoy your own company. For the most part, truckers work independently and spend long hours on the road by themselves. If you have a hard time being alone and prefer to work with others, there is a possibility of working as a part of a two-person trucking team.